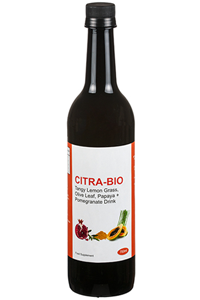 This wonderful probiotic comes to us from Australia. It is made using a unique, multi-strain fermentation process that encourages the rapid growth and reproduction of friendly bacteria. 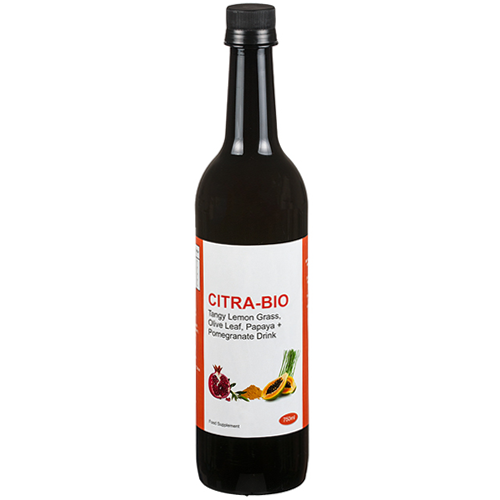 It is also a source of Oleuropein, the active ingredient found in olives and olive leaves. Take 20ml daily, with meals or as recommended by your Healthcare Professional. May be diluted with water or soda water to taste. Probiotic Lactic Acid Beverage( 100%w/v) fermented from: Papaya (Pawpaw) fruit (~1875mg fresh) and leaves (~1875mg fresh), Pomegranate (~5000mg fresh), Olive Leaf Extract (~2320mg fresh), Turmeric (~1875mg fresh), Lemon Grass (~10000mg fresh), Celery (~5500mg fresh), Citrus mixed Bio-flavonoids (1375mg). Pregnant women and children under the age of 12 should not use this product, unless under the recommendation of a health care practitioner. Store below 30 degrees C and refrigerate after opening. Gently shake before use and release cap slowly.